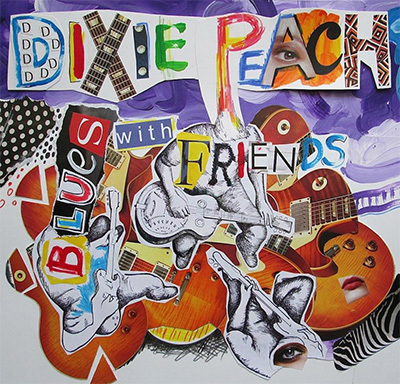 Blues With Friends is the latest album from Dixie Peach, an American blues band which formed in the early 1970s. Although the group essentially broke up in 1975 due to the obvious stresses of touring, they reformed in 1998 to be stronger than ever and with a loyal following. While they may not be the most cutting-edge players in the blues scene, Dixie Peach have made their mark on the legendary genre and continue to do so with such noteworthy albums as Blues With Friends. Blues With Friends begins with “Too Much Trouble,” a song with a twangy guitar, gruff yet strong vocals, and a bass that will entice you to keep the rhythm right along with it. The song is like a warning to himself, a realization of his current and impending situation: “Too much trouble / Too much trouble lies ahead / Too much trouble / Too much trouble leaves you dead.” The second track, “Pork Chop Blues,” has an undeniably catchy horn section laced with ongoing guitar distortion and soloing. This fabulous instrumental backs the story of a typical blues story with a unique metaphorical twist — his woman left, but she also took his “pork chop,” “took the meat right off the bone.” “Night Ride” is the third track, and is certainly a moodier, slower, and more thought-provoking tune, accompanied with ’80s rock-like inspired harmonies in the chorus, making the entire song stand so uniquely apart form the rest of the album. “Coming Home Today” has a more folkish, soft, acoustic sound to it, instrumentals played against a very bluesy tale — “My baby’s coming home today / It ain’t been the same since she’s been away.” The fifth song, “Don’t Want To Wait,” is a song about Heaven, and not wanting to wait to die to get to experience what death itself brings. The song has a very strong, happy and optimistic tone, with energetic and beautiful female backing vocals and harmonies. “Bottle Hymn of the Republic” is an instrumental, and its placement serves as a refreshing break right in the middle of the album. The guitars are practically singing themselves — it’s a truly catchy, inspiring tune that instantly puts the listener into upbeat, uplifted spirits. “Trouble With Love” is a unique contrast from the previous, for again, this track seems a bit moodier in its overall tone. The beautiful thing about the blues is that it is so real, honest, and simply spoken, as if in conversation with the listener, and this song exemplifies this quality with perfection. “It’s Crying Time” is a slower track with almost a Billy Joel sounding quality to it; beautifully written and melodically sound with a gorgeous piano and of course, a wailing guitar, the song is catchy and definitely worth listening to. “Wait a Minute” follows wonderfully the standard blues pattern and story — love gone wrong. Finally, “Rick’s Shuffle” is a another instrumental, ending the album on a strong note that makes the listener want to grab a his or her significant other and start dancing. Blues With Friends is a great album, one that will have you belting or jumping up to dance. Dixie Peach continues to keep their pace with the blues scene newcomers, and will surely continue to make strides in the years to come.